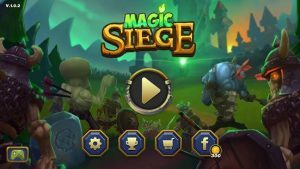 Magic Siege Defender : You are a powerful mage which defends own castle from the waves of monsters. It will not be easy! You will necessary to use your tactical skills and the impressive quantity of magic skills and magic scrolls with different effects to kill all your enemies. Using the spell upgrade system, you will raise might of your spells, to kill more powerful monsters. Nice game. Similar to The Defender, but here is something new. I like it.